In the summer of 2016, Manomet’s U360 intern and College of the Atlantic senior Lilyanna Sollberger took a closer look at sustainability trends for small businesses in the food industry as research for her final college thesis on food waste. Using the Root360 sustainability survey, Sollberger engaged with small businesses to examine the business’s current social, environmental, and governance practices. By the end of her internship, she had interviewed 16 small businesses in Maine, New Hampshire, Vermont, and Montana – nine restaurants/cafés, two natural food stores, two food manufacturers, two food distributors, and one craft brewery. The following is an analysis of sustainability trends Sollberger observed across the small sample set of food-related businesses she studied. Sollberger reported that most of the businesses she spoke with understood the importance of fostering employee creativity and innovation, and self-reported that this is an area where they are strong. The business owners she spoke with gave various examples of how they foster employee creativity – some involved ways to directly seek input, like having a suggestion box; some were incorporated into business operations, like offering menu items created by employees; and some quite literally celebrated creativity, like purchasing employee art. The high level of importance placed on this area indicates that these businesses understand the benefits of involving employees in the creation of products, processes, and services. Not only does it allow room for ideas and strategies business owners may not think of on their own, but employees also feel valued and like their contributing to the business. The benefits to the business of high employee satisfaction are numerous. 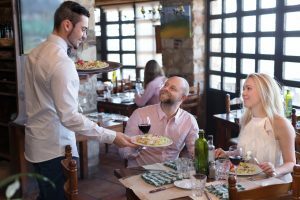 Fostering employee creativity is particularly important in the food sector; where keeping menu options exciting and ‘fresh,’ streamlining processes to increase efficiency, and maintaining customer satisfaction are all daily demands. In contrast, many of the businesses Sollberger studied were weak in the areas of workforce support. This includes offering employee benefits (e.g., health insurance, retirement, and paid time off), providing employee feedback (either informally or formally), and communicating company policies in an official manner (e.g., an employee handbook). Very few of the businesses had systems in place for any of the aforementioned support strategies. 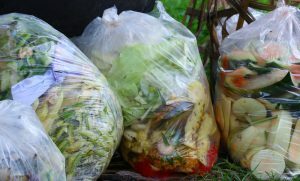 When asked about their efforts to reduce, reuse, or recycle materials, most of these food-related businesses focused only on recycling, with little or no mention of efforts made to reduce consumption. Minimizing waste saves a business money (both in lost product and disposal costs), yet nearly none of the businesses incorporated reduction strategies into their waste management plans. Examining the recycling efforts more deeply, nearly all of the businesses recycled most or all of their paper and cardboard; while the amount of non-paper materials (e.g., glass, plastic, metal, etc.) varied widely, based on what services are available in the business’s municipality. For example, glass is not recyclable in Montana, so businesses there are forced to throw glass in the garbage. Reducing the use and consumption of glass products could save businesses money when disposal charges are based on weight or volume. Sollberger found it extremely rare that a business she spoke to did have a written customer satisfaction policy. While many had informal or implied refund policies, they weren’t formally communicated to employees or customers. The absence of a written policy can lead to inconsistent decision-making, a lack of consumer trust, and the need to consult a manager more frequently. A written policy that all customers and employees are aware of can ultimately make transactions more efficient. While many of the Root360 survey questions explore the internal practices of a business, there are also questions that address the external factors that can impact a business’s bottom line. While all business owners typically have full awareness of the choices and decisions being made within their company, knowledge of externalities varied widely among the businesses Sollberger studied. For example, nearly every business was aware of all of the regulations with which they need to comply. However, the businesses’ understanding of their supply chain varied, and almost no business knew where or how their electricity is being generated. These factors can pose unforeseen and costly risks to a business, and gaining more knowledge is the best way to protect your business from these risks and increase resiliency. The final trends observed by Sollberger were based on variations in a business’s size and type. She found that how financial duties are separated varies depending on the size of the business. Almost all of the larger businesses she spoke with separated all of their financial duties, where most of the businesses with 15 or fewer employees reported only some or zero separation. Separating financial responsibilities among different people (i.e. writing and signing checks, managing the books, balancing the books, etc.) creates a checks and balances system that promotes transparency and decreases the risk of making costly mistakes. While larger businesses may have a greater capacity and staff size to separate these duties, it is equally important for small business owners to outsource some of these responsibilities as well. Whether a trusted employee or outside professional, creating a checks and balances system for your business’s finances can greatly minimize errors. Despite being a very water-intensive industry, almost all of the businesses Sollberger studied that have food or beverage production (breweries, restaurants, and manufacturers) reported using a low percentage of water-saving technology. And many of these businesses assessed their efforts to minimize water use as ‘fair’ or ‘poor.’ Wasted water costs a business money, so there are financial advantages to installing water-saving technology and making efforts to reduce use. Additionally, water shortages can impact a business’s ability to operate. While this may not currently be an issue for the New England businesses, Montana is already making plans on the state-level for potential drought conditions in the future. This is just a brief look at the many different employee, environmental and management practices that a small business in the food industry must address. But these issues are also important for any small business. Want to find out how your small business fares against these trends? Take our www.root360.org survey and see learn how a triple-bottom line focus can help your business run more efficiently, sustainably and profitably. U360 is designed to deepen college students’ knowledge of sustainability and small business management through a series of educational workshops and direct engagement with small business owners nationwide. During interviews with small businesses of their choosing, students use the Root360 sustainability survey to examine the business’s current social, environmental, and governance practices. The students are then taught how to analyze the businesses’ current level of sustainability, identify areas for improvement, and make specific recommendations for increased sustainability.